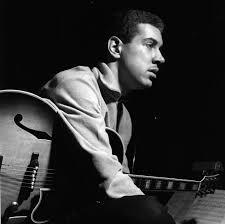 Kenneth Earl "Kenny" Burrell (July 31, 1931) is an American jazz guitarist from Detroit. With Wes Montgomery and Charlie Christian he is one of the most influential jazz guitarists, epitome of good taste and unique swing. His guitar sound is clear, refined and raw, easy to recognize. His guitar playing is unique, grounded in bebop and blues, the man is able to play both blues licks and swinging bebop lines. He has played Gibson guitars (ES-175, super 400) for the majority of his career plugged into a Fender deluxe amp. These pages are regularly updated with new lessons, please don't hesitate to subscribe to the newsletter. Here are 10 kenny Burrell blues jazz guitar licks transcribed from Chitlins con carne. Jazz guitar lesson with tabs, video and analysis. Here is a guitar transcription with standard notation and tabs of the theme of the jazz tune "in a mellow tone" performed by Kenny Burrell.